I can't tell you how glad I am that the Lazy Song has finally pushed Grenade off the radio (for the most part). But, unfortunately, SiriusXM still likes to play it and it comes up two or three times a shift when I am at work. Grenade makes me want to pull my own hair out, and once it's all gone, pull out the hair of whoever is standing closest to me too. And it has nothing to do with the fact that once I hear it, it's stuck in my head for the next two days. (Although that's pretty annoying also). "You take, take, take it all/But you never give"
Hello? Bruno? Red flag right there!!! This is obviously a one-sided relationship, if you can even call it that. "Gave you all I had/And you tossed it in the trash"
Okay, so, not only does this chick not reciprocate your feelings, she doesn't even respect them. This is not someone worth your time! 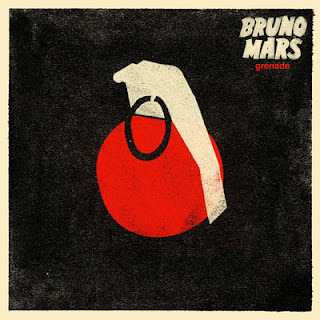 "I’d catch a grenade for ya/Throw my hand on a blade for ya/I’d jump in front of a train for ya/You know I'd do anything for ya/I would go through all this pain/Take a bullet straight through my brain/Yes, I would die for ya baby/But you won't do the same"
I'm not going to go any further with the lyrics. It's all right here. This is some pretty serious stuff. Now, I know it's just a song and that these are figures of speech...but they irritate me all the same. The problem is that the 'unrequited love" bug is going around. I believe this is thanks in no small part to Twilight. There's something extremely fashionable right now about obsessive love that is not good for you. Something about clinging to the pain of rejection that somehow makes you deep and soulful and worldly. Remember when being emo was like totally cool? The thing that worries me is that pre-teens and teenagers and even many adults think this is normal behavior. It's not something I can say I fully understand. Sure, I had a lot of one-sided crushes growing up. Sure, I had my fair share of teenage angst. But it was never something that defined me. Not until my last relationship. It was not a healthy relationship. Even though my last relationship was not unrequited it was, for lack of a better word, obsessive. At that point in my life, my best friends were far away, I didn't get along with my roommate, and the friends I was closest with nearby were starting to discover different interests and head off in different directions. It was early in the college years where we were all still figuring ourselves out. I was lonely and awkward and shy in a place that was completely foreign to me. So when my ex and I first became friends and quickly learned all of the completely random things that we had in common we became really close really fast. Finally, I wasn't lonely anymore. Because I was shy, I had a hard time making friends away from him. I used him as a crutch. And he grew increasingly frustrated with my insecurity. But, it wasn't all me. He had his insecurities as well. He would go into weeks of depression and would get mad at me when I tried to talk him through them. He also didn't help my initial cling to him by being the first to say "I love you" not even a month after we had met. He was also the first to bring up the idea that I might be someone he'd like to marry someday. This was all very early into our relationship. We both were attempting a very serious, very adult relationship while we were both just kids. It was doomed to fail. Reading Twilight was painful - and not just because of the horrible writing - but because it was like revisiting that relationship. And the worst part about it was that, terrible as it was, it was addictive. Obsessive love is addictive, and it's destructive. And, unfortunately, there's no rehab or treatment or pill that can cure it. Since the end of that relationship, I haven't dated anyone. I've had crushes, but no serious feelings. A big part of it is that I am living at home and don't want to be here forever. I don't want to go looking for a relationship when I can't guarantee that I'll be around long enough to see it through. I also haven't met anyone who has made me think sticking around here would be worth it, or even worth the effort and time a relationship requires which would take away the time and effort I am able to put into finishing my MA. This is not to say that if such a person comes along I won't be happy to do so. Tom Petty "Don't Come Around Here No More"
Rolling Stones "It's All Over Now (I Used to Love Her)"